This girl. She is a scene-stealer and sassypants. 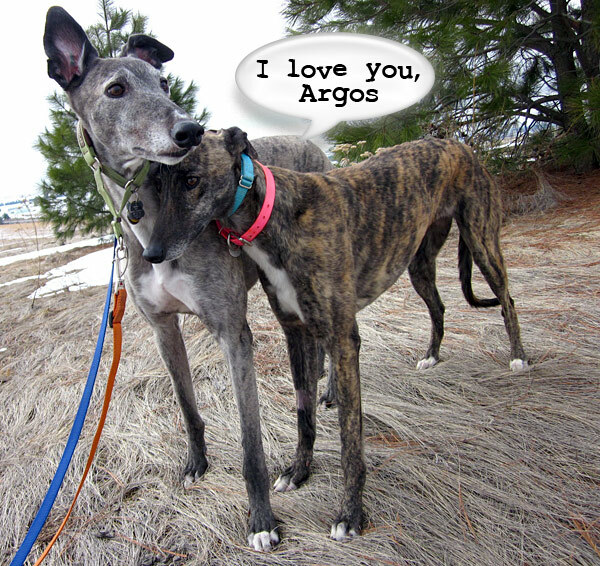 We lost Argos the Greyhound very suddenly in June of 2016 due to osteosarcoma (more on that on Argos’ profile below). Our family was heartbroken. We decided to wait on another dog. Be a “one-dog family” with Purl. Sounded like a sensible plan but… Purl was also heartbroken. My son found this ball-of-energy comedian on a site called RescueMe.org. She needed a home. 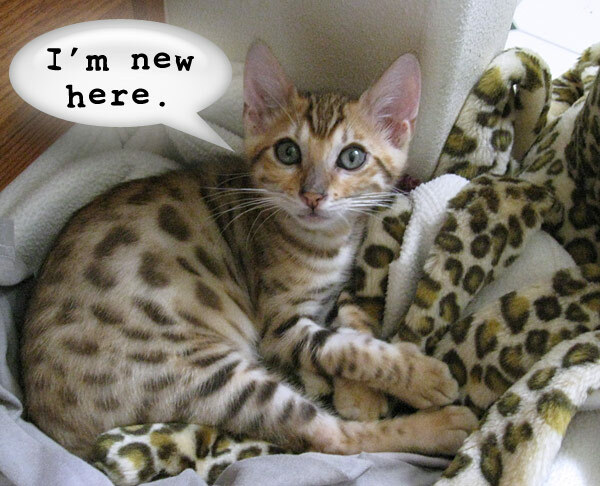 So I began communicating via email with the person seeking to re-home her. We met in July of 2016, and thus began our journey with 3-year-old Avie the Corgi. 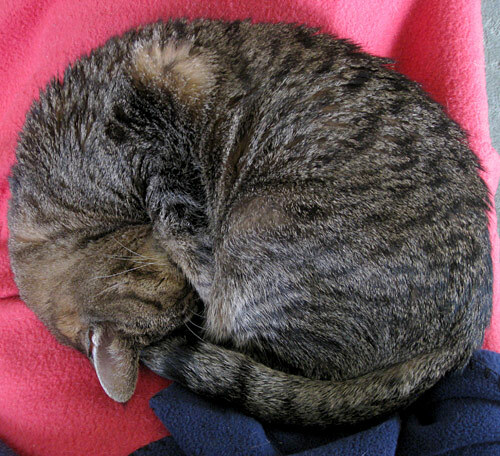 My sweet silent kitty I found in my barn in the spring of 2009. He was about 7 months old, completely matted, skinny and … silent. He can’t meow. Which somehow makes his expressions even cuter. He is kind of an “old soul” cat. He is playful and mischievous but has a sense of wisdom too. He reminds me of my Great Cat Herman. Barnie being harassed by the geese. Quincy arrived in June 2010. He was a gift. It was a planned gift (we knew in advance), but not planned… if you know what I mean. 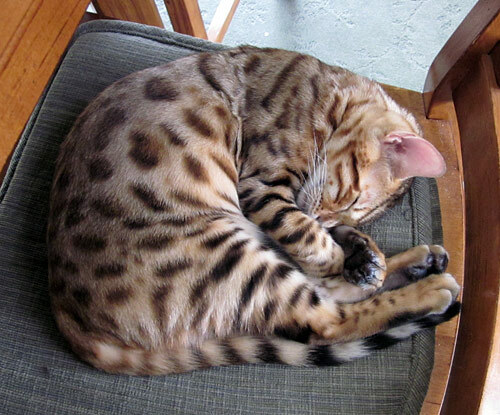 Quincy is a Bengal – he came to us via the family of a very dear friend who has been dealt a difficult hand. We love him. He literally makes us Laugh Out Loud every day. In between the “no! Quincy!” training sessions. 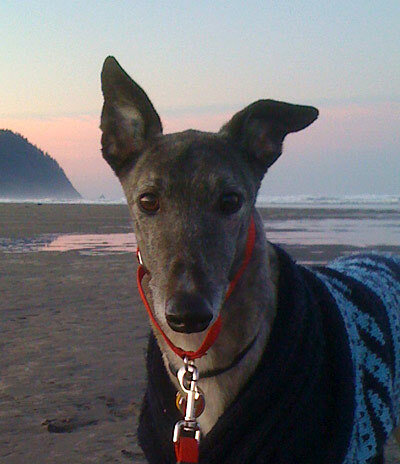 Hammer was our first Greyhound foster – he found a home after a couple months. We decided to foster another Greyhound. Well, we didn’t “decide” so much as I felt so sorry for “Burro” after seeing her terrified-deer-in-the-headlights photo on her adoption page. Who would adopt that dog? So we made a fairly fast, no-questions-asked decision to foster. 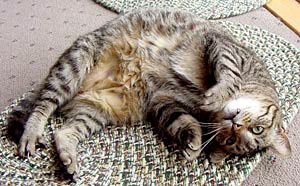 It was only a short time later that we failed fostering, and Purl came to be ours in March of 2010. I was telling my friend about “Burro,” and she misunderstood me, thinking I said “Pearl,” which of course I liked a lot better. We spell it Purl, since I love to knit. She didn’t mind. And she comes to Purl just as easily as Burro. Purl a year later: she is her own dog! 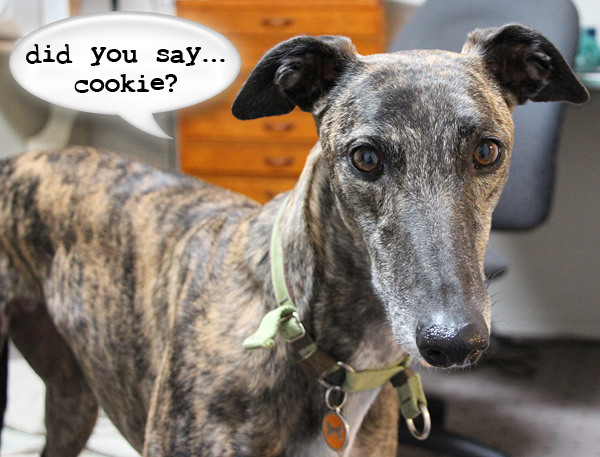 Very much a cookie-lovin’ dog. Oh, Sophie. She is everyone’s best friend. My heart dog. We adopted her from the shelter in 2002. She was the most amazing dog — helping us raise kids and navigate through life. She suffered from separation anxiety and noise phobia, which taught me more about these two common conditions than I ever learned in school. She was a patient and gentle teacher. 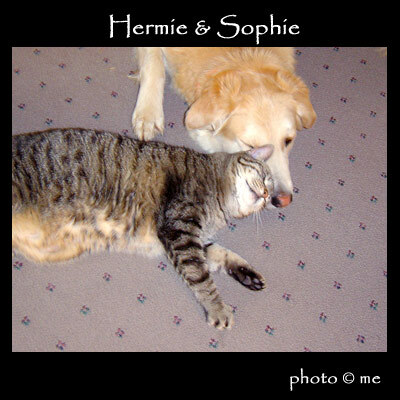 October 2013: Farewell, my sweet Sophie. We miss you so much, sweet girl. 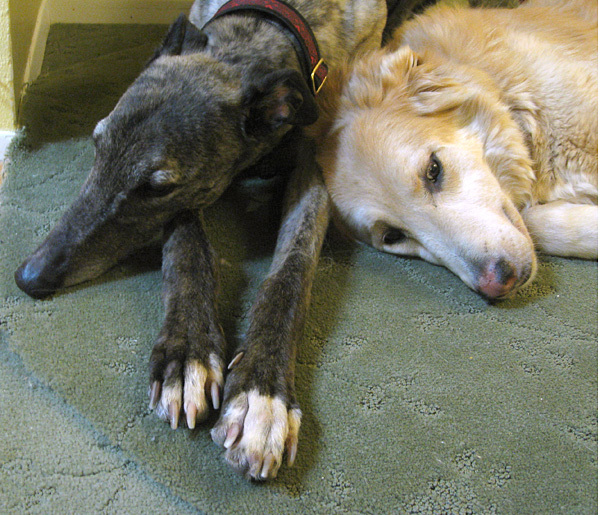 We adopted Argos from a local Greyhound rescue group in December 2009. He was huge – very tall. But thin. Yeah… yeah… Greyhounds are thin. But he was thin even for a Greyhound. His papers said 80 pounds, but hmmm. I took him to the clinic and we weighed in at a paltry 67 pounds. Not good. In the course of a year, he blossomed – up to a more fitting 82 pounds, and he is personality plus! Seeing him learn what toys are, how to play, and gaining that self-confidence has been the most rewarding part of his adoption. 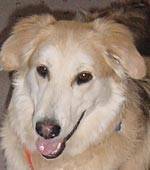 June 2016: We lost our beloved Argos very suddenly and unexpectedly to osteosarcoma.It was a busy time of year — we had a graduate in the family — and as we came home one evening, Argos and Purl came running up to the door as usual. Except Argos crumpled in excruciating (and horrifying) pain. He had a “pathologic fracture” of his humerus. This happens when disease, in this case, bone cancer, destroys the bone and makes it very weak. Something as simple as trotting to the door to greet your humans. It was heartbreaking. Greta came to the clinic in 1992, on Halloween, hit by a car. She took most of the hit in her face – broken nose, broken teeth, and scratched up. We tried to find her a home after she recovered, but no takers. I had just adopted Herman (also brought in the clinic, run over, just 3 months prior). Things weren’t working out – young Herman was terrorizing Lucy (the siameseX I adopted in 1988), and my house was upside down. Adopting another cat might be asking for it. Or maybe it might work….? So Greta came home with me. Greta and Herman instantly bonded and were buddies for life. They ignored Lucy. Everyone was happy. 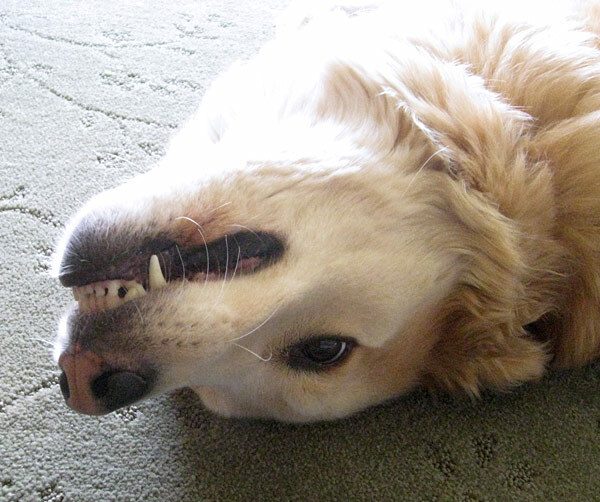 2011: Greta – natural causes. She lived a long, relatively trouble-free life.